Ohana is not a quiet, peaceful place. Let’s just put that out there from the start. While the dinner period is not a “character meal”, there seems to be quite a few people running around with brooms and hola hoops and such all the time, injected with loud, taped musical interludes tossed in here and there. Hey, it’s Disney... I get it... but really, they might as well just toss in a character walk-around every now and again. The dining room itself looks best in the evening, after the sun goes down. Warm wood tones and dull greens abound in the midst of floor to ceiling tiki statues. It’s all very cool, if you can grab a quiet second, and really look around. 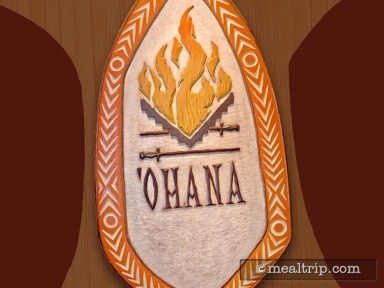 The cuisine at Ohana’s is, slightly Asian with Tropical fruit flavors here and there. The meals are served family-style (so large platters of food will be delivered table-side along with small plates), and you can get additional helpings of whatever you would like more of. It’s all more geared to mass-acceptance than “authentic” Polynesian-fare. Typically the meal starts with a bread and salad course followed by a main course that includes skewered meats like chicken, pork or steak, along with oak-grilled shrimp. Interestingly, the meats are grilled in the middle of the restaurant in an open-view grilling station. Sides can include lo mien noodles, stir-fried vegetables and dumplings. The meal is topped off with a warm bread pudding a la mode that includes a banana-caramel sauce. The location itself is located on the second floor of the main lobby building, but you may have to search around a bit for the check-in desk. While it is usually on the second floor... it seems the check-in podium is often clear on the other side of the main walkway. This is a very popular location, and reservations are highly recommended.